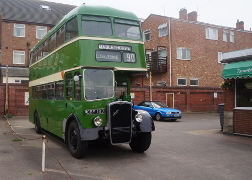 Lincolnshire 2115 (DBE 187) took a group of members on an outing to Skegness on 7 August, and it operated a run over service 90 to Mablethorpe, re-cteating a journey it had operated exactly 50 years before (more here). Above right - 2115 at the former Drummond Road bus station, Skegness. 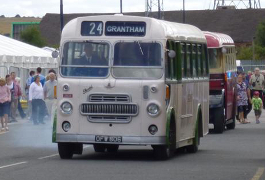 A number of buses from the Museum and from members' collections operated park and ride services for the Grantham 'Festival of Speed' over the weekend of 7-8 September, held to mark the visit of record breaking LNER steam locomotive 'Mallard' to Grantham. Visits to the Museum by people who have memories of working on the buses, or in road haulage or the motor trade, are always welcome. A notable recent visitor was retired Lincolnshire Road Car bus driver Mr Arthur Scott of Newark, now 102, seen (right) with the Society's 1935 Leyland Tiger new to Lincolnshire Road Car. 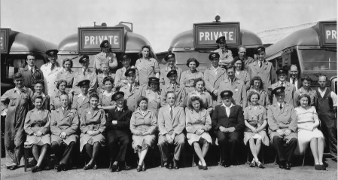 Mr Scott is second left, front row, in the photograph below, taken in 1945 at Lincolnshire's (then) Newark Depot in London Road, Balderton, to mark one of the wartime conductress' leaving the Company to return to her native Poland following the end of the war in Europe. Mick and Roy have taken this motorcycle in hand. The bike has been stripped down, with parts sent for sand blasting and the wheels are being re-spoked with new rims (the ones fitted were rusted and not the originals). 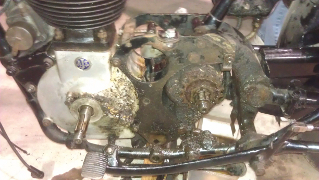 The gearbox was jammed and has been stripped down, fixed and re-built. The engine has currently been partially stripped and is in the middle of being checked over. A few chrome parts have been sent for re-chroming. A shopping list of parts is being compiled. Brian and Lee are working on the wooden shutters that fit in the sides of the rear compartment. Attention is also being paid to a slight malady in the rear suspension. Paul has made significant progress in repairing the front wing and getting everything to line up with the bonnet and radiator. At present the wiring to the rear lights is being sorted out. The MOT is due in the near future. This vehicle was used as our control point at the RAF Waddington AIr Show, but on its return it suffered from cooling problems, most unexpectedly as it ran so nicely! The good news is that new head gaskets etc have been acquired and the engine is being rebuilt. Following the RAF Waddington Air Show, Lincoln 73 has been a little troublesome, with the result that the fuel injection is now being investigated. At the time of writing, the lift pump is suspected as being faulty. 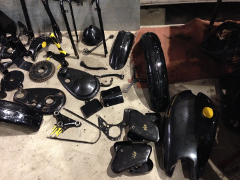 above - the AJS in the process of being stripped down, and the kit of parts resulting! above right - radiator being re-fitted after attention. 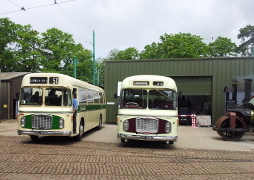 The former Lincolnshire Bristol Lodekka, LFW 326, and Leyland Tiger, FW 5698, have both been MOT tested. The SS Jaguar, Austin 12 and Austin 18 were all used for a wedding recently. 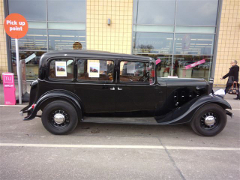 27 March 2013 - The Museum's 1936 Austin 18, JV 4936, visited Lincoln Sainsburys to promote the Easter Sunday Open Day event. 12 May 2013 - The Museum's 1951 AEC Regent III / Roe, KDT 393 (Doncaster 122) along with our Chairman's 1961 Bristol MW / ECW, OVL 465 (Lincolnshire 2245) visited Sheffield for an event to mark 100 years of public transport in Sheffield. 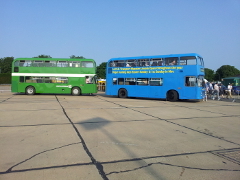 right - OVL 465 and other buses at the event. 16 May 2013 - The Museum's 1945 Wartime 'Utility' Daimler CWD6 / Duple, VV 8934 (Northampton 129) took part in the events at RAF Scampton to mark the 70th anniversary of the 'Dambusters' raid in May 1943.
left - VV 8934 at the 'Dambusters Inn' in Scampton village. 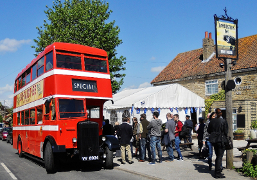 18 May 2013 - The Museum's 1935 Leyland TS7 Tiger / Burlingham, FW 5698 (Lincolnshire 1411) took part in the annual Lincolnshire Wolds Walking Festival, providing a service on the first day between Horncastle Market Place (above right) and Scrivlesby (lower, right). 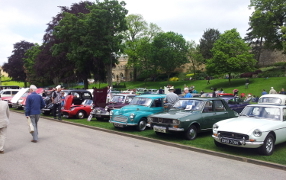 9 June 2013 - The Society's annual rally at Lincoln Castle took place in fine weather. More here. 23 June 2013 - CVL 850D, 1966 Bristol RE coach (Lincolnshire 1431) from the Museum collection, visited Eastern Coach Works' home town of Lowestoft in June for the 'Hop on a Bus' day at the East Anglia Transport Museum - here with contemporary Eastern Counties RE SVF 896G. 6 - 7 July June 2013 - The Society operated its usual park and ride service, and had a hangar display at the RAF Waddington International Air Show. More pictures here. 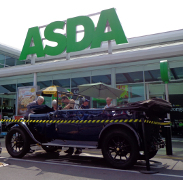 12 July 2013 - The Museum's 1928 Austin 12, TL 48, was on display at Asda, North Hykeham, to publicise the Museum and coming events. 13 July 2013 - A members' outing to the National Railway Museum took York Pullman 64 (JDN 668, 1954 AEC Regent III / Roe) back to its home territory. 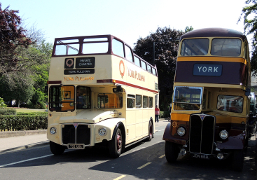 A chance encounter was had with a member of today's York Pullman fleet (a revival of the name, not the same company) - 792 UXA is a 1961 AEC Routemaster, new to London Transport as WLT 787 (RM 787) and later re-registered and converted to open top form. 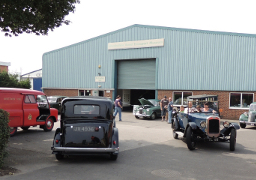 14 July 2013 - The first of what we hope will become an annual event - a car running day. Six of the Museum's cars offered rides during the afternoon, and a number of visiting classic cars also came to the event, and again, we had good weather for the event . More pictures here. The rear mud flaps have now been fitted, together with all the wheels, so that the bus can be moved to a better spot for work to continue on the roof. The window surrounds and drip rail have been primed and undercoated, but some rotten waistrail framing has been uncovered and needs replacement. All the seats are now fitted and work continues on the interior lights and polished wood trim. Not officially part of the museum fleet, this useful vehicle is used at events such as Waddington Air Show, and has been lettered to advertise the Museum and coming events. A new brake valve and rear levelling valve have been fitted, and the bus has received some new front tyres and rectification to the air and electrical system. Overhauled injectors have now been fitted, together with replacement rocker gear in the hope of reducing a rather noisy engine. Our Easter Sunday Open Day on 31 March was another successful event - more here. We are introducing a new event to our annual calendar this year, an informal car running day - on Sunday 14 July 2013. More here. Castle Rally (Sunday 9 June 2013) - The formal deadline for vehicle entries has now passed, but there are still a few spaces available, and late entries are welcome, although these may not appear in the event programme. The Society is pleased to announce the granting of Accreditation by Arts Council England under the 2011 standard. 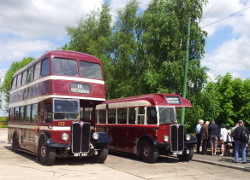 Doncaster 122 (1951 AEC Regent III, KDT 393) and one Lincolnshire Road Car bus from the collection will be attending the Sheffield Buses 100 anniversary event in Sheffield on Sunday 12 May and taking part in the bus service linking the rally at First South Yorkshire's depot at Sheffield, Olive Grove and the South Yorkshire Transport Museum. The Society's Leyland Tiger TS7, FW 5698, will be providing transport from Horncastle to Scrivelsby on the launch day of the Lincolnshire Wolds Walking Festival, Saturday 18 May. This is now in the workshop and has been stripped down by Roy and Mick, they are now assessing what parts need to be sourced in order to get it into running order and cleaning up the frame. Welding work continues to get the body ready to remove from the chassis. Work has continued on the Gipsy, Brian and Lee have been building it back up since it returned from paintwork at the Co op. It now runs and drives, its windows have all been fitted up and its seats are away at the upholsterers having some stitching replaced and a few small repairs - the Gipsy was on display at our Easter Open Day, and passed MOT in mid April. The Bedford has seen quite a bit of work since the new year, the gear linkage has been removed and new bushes made, now refitted its possible to select all gears cleanly and it is much easier to drive. The rear wheel arch has been re -made and refitted to the van and the whole lower half of the inside rear has had a fresh coat of paint. A few other service items have been addressed and we are planning to replace the cracked tyres in the near future. More work to front end has seen the interior of the destination box being cleaned out and repainted and the light fittings renovated. The exterior drip rail above the windows has now been stripped of paint and all the window surrounds are now rubbed down. When the weather gets warmer these will be primed and undercoated. We are looking to raise approx £30,000 for ONO so it can carry passengers once again (the seat frames are currently being renovated by members in the depths of a very cold workshop!) and to get the majority of the work outsourced, so it can return to the road quickly. The Board allocated money to this project following the Nov 2012 Open Day and with extra donations generously given by members this has now grown to £4,000. ONO 59 covered 120,000 miles on a world tour in the late 1960s as a caravan before being presented to us, and it has been kept in running order since then. Work continues with all the interior fittings, particularly the front bulkhead trim which is proving to be fun to get it right! The rear destination box area has seen more work and is complete and looks lovely with the re-chromed handle, fasteners etc on the new covering . The life guard rails are now primed , undercoated and glossed. This is now back on the road following rectification of an electrical fault in the cab which resulted in a partial rewire of the lower saloon. The ceiling panels etc had to be removed in the process! An engine water hose was also replaced. The injectors have been serviced and are being fitted shortly. 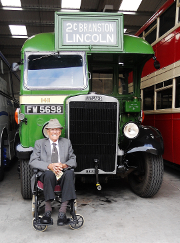 Lincoln Corporation 36 has £3,000 allocated following the November Open Day, and we would like to tidy it up for the 110th anniversary of Lincoln Corporation Transport in 2014. Further donations to this fund are most welcome. The front end needs lots of work, mostly difficult welding and fabrication, as well as a body repaint. New cast aluminium water jackets have replaced the two rotten originals! 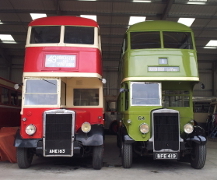 These were supplied by the Aire Valley Transport Collection group, to which our sincere thanks are sent. These were machined locally and drilled out for fitting, at the museum. Thanks to all with the above work on these vehicles. We have had the opportunity to consider ordering 6, 22 inch tyres for TF 818. These are being made as a one off in the USA and will enable it to be roadworthy again. Trouble is these are approx £ 500 plus VAT each. And we have to say YES or NO pretty soon! We have no funds for these at the moment, so if anyone has any way of helping we would love to hear from you! 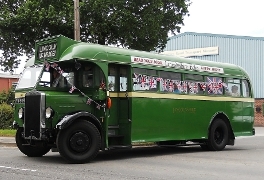 TF 818, Lancashire United 202 is one of the two buses repatriated from Jersey on the Societys formation in 1959. After much work and tuning / setup by Roy and Mick this now runs and starts much easier, it has now had a few oil leaks fixed and is now back on display. 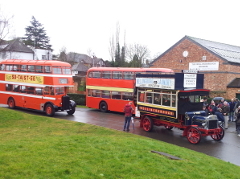 Austin 18, Ford V8 and Chevrolet Coach - these all went for MOT and passed with flying colours two weeks ago, we have been doing a few servicing jobs on all three and checking them over making them ready for use at Easter open day. 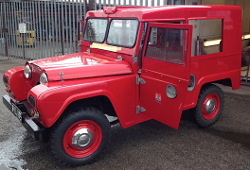 This has just returned from the Lincoln Cooperative workshops after servicing of the brakes and is now MOT tested. 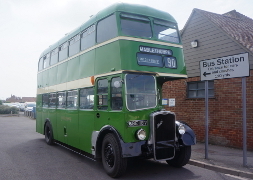 This bus attended the 'Wellingborough 100' event on 16 March, marking 100 years of buses in Wellingborough, Northants. This one-time Museum resident, owned by one of our members, made a return to the Museum in March to receive some attention. Our 'end of season' Open Day on 4 November was again a record breaking event - more here. Museum 'Open Day' events, Easter Sunday 31 March and Sunday 3 November 2013; Castle Rally Sunday 9 June 2013. Once the Gipsy had left the workshop for paintwork we had a tidy up and rearrange so that progress can be made with the Austin 16, its welding work has now resumed and the back end of the bodywork is now stabilised with new steelwork and replacement timber. James has begun work on the repair of the front wings and we hope to have the body in a strong enough condition to lift it off its chassis in the New Year. After many months of bodywork preparation the Austin Gipsy is now in paint, after the decision was made to send it out of the museum to be painted by the Co-op it has now returned looking shiny and bright red. Having it painted professionally has made a huge impact on the look of the car and once completed it will look like new again. It is now back in the workshop and being reassembled to get it prepared for its first MOT in a while! We plan to have it all finished ready to be on display at the Easter open day. Repairs to the front dome and structure continue, together with new frame work as necessary around the entrance. Several panels have been prepared for re-fitting and the cab seat has been completely reupholstered. This bus has received an inspection on the pit. The decision has been made to return 'ONO' to road-worthy condition as soon as is feasible. Longer term, the vehicle would benefit from a body overhaul, possibly with professional help to remove the scars on its roof sustained on its 1960s world tour. Obviously, the latter will cost many thousands, but at least we can strive to get it on the road again as a first step! IT will be good to give folk the opportunity to ride on it as soon as we can - we do have a set of seats for this lowbridge bus, although of course these need work too! All the existing seats have been rebuilt with new foam. Local firm ABC Windows have fitted a new rear window. New trim is being sourced for the interior around the window. Work continues with the wood interior trim - including the bulkhead and light fittings and signage. The cab side panel is being renovated with many holes and damage being repaired. Some chassis cleaning continues. Further investigations to the bus 'white' smoking on occasions have seen the inspection of the injectors. The 'buggy bus' has received new brake cams to the rear axle. The Capri was moved into the workshop after open day - rather than going back into the museum at the end of the weekend it was decided to put the Capri onto the ramp in the workshop in order to get it running and assess its condition to see if it could be put on the road in the near future and if so what would be required. 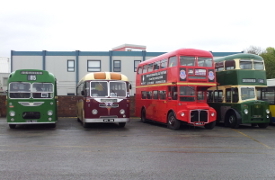 An MOT has now been attained and the bus gave rides at the Open Day. A subsequent slight air leak on the gear box is being investigated. The rear axle oil seal has been renewed. 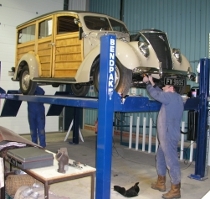 Recent work at the Lincolnshire Cooperative Workshop has included a brake overhaul, and MOT preparation. 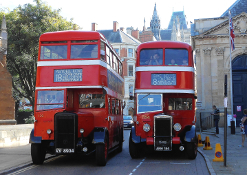 The Museum took part in the national annual Heritage Open Day event on 8 / 9 September, opening on the Saturday of the event for possibly the first time, and operating buses and cars from the Museum collection on Sunday. 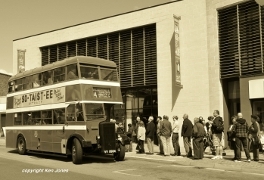 Over 50 visitors came to the Museum on Saturday, and around 100 on Sunday, many of whom took a ride on one or more of the former Lincoln Corporation buses (23, 64 and 73) that provided an hourly service to the City Centre, and / or the Museum cars (Austin 12, Austin 16, Ford V8) that were also offering rides. The Society flag was also shown on Saturday at Northampton, where Daimler No. 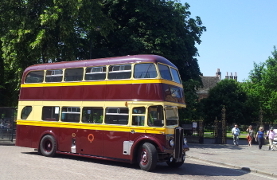 129 was re-united with other former Northampton Corporation Daimlers to provide a 'heritage bus trail', and in Retford where members' buses ran a service linking attractions in the town. 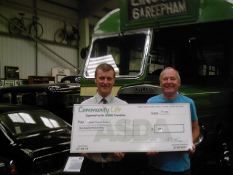 On the 7th July, the Store Manager of North Hykeham Asda came to the Museum to present a cheque for £100 for our funds. 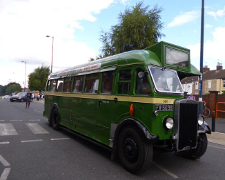 This was a follow on from the community open day that Asda held in March when a few of our members attended with the Museum's Lincolnshire Road Car Bristol Lodekka bus. More on Asda's website here. 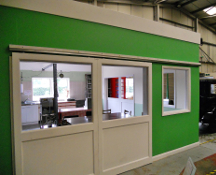 The new canteen / meeting room structure in the Museum is now complete. Peter receives a cheque from local Asda store manager as part of Asda Community Life scheme. Northampton 1945 Daimler CWD6 VV 8934 meets 1947 Northern Counties bodied ANH 154 in Northampton on 8 September while operating 'Heritage Open Day' bus service. HTL 913, Bedford CA van, on display outside the Museum on 9 September 610 BRM, 1960 Velocette outside the Museum shortly after its restoration was completed. New vehicles for the collection! 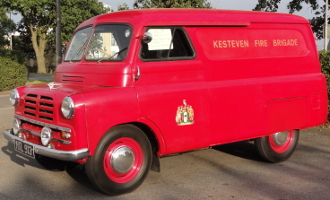 We have recently taken over the ownership of HTL 913, a 1954 Bedford CA van, originally supplied to the Kesteven Fire Brigade at the Sleaford Fire Station for general duties. Preserved for over 35 years now it is in lovely condition and was on show at the museum for the Heritage weekend in September. Our sincere thanks go to Pete Holland for the very generous donation of this most delightful local and once popular type of van. 610 BRM - 1960 Velocette Viper 349 cc Motorcycle The single cylinder, 349 cc Viper', designed by Charles Udall, was introduced in 1955, as a successor to the Velocette MAC which had been launched in 1933. 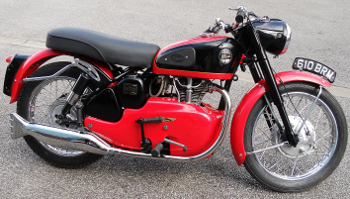 This motorcycle was bequeathed to the Society in 2003 as a 'kit of parts' by a long standing Society member, and after some years in storage, it went away from the Museum for restoration by Society members Phil and Chris in 2011, returning in running order in summer 2012. The '10' is now running after its full service, head gasket replacement and new exhaust system - it still has a small running issue which we are currently fault-finding and as soon as its sorted it will be ready for an MOT. The Gipsy is still in the process of being prepared for paint but we can see light at the end of the tunnel now - we can soon stop sanding and move on to paintwork. We are currently servicing cars ready for open day in November - both the Ford V8 and the Austin 18 are getting a full service and tune up in readiness for carrying passengers on November 4th. Dave B and Daryl have checked over the front brakes. The seat frames have been 'dry' fitted, removed and are being painted once again. The interior panels below the windows are now cut to size and fitted, with the finishing mouldings being prepared, stained and varnished. Some replacement mouldings have been made for the interior bulkhead, and some floor traps have received attention. All the seat cushions have been thoroughly hoovered and shampooed, likewise the seat backs. The latter have had some damage repaired too. Thanks to Peter, Dave E, Stephen D, Matt, John and Pam here. 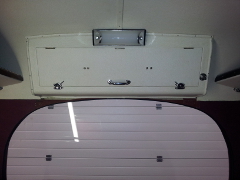 More wood has been fitted by Eric, this time above the rear emergency door. 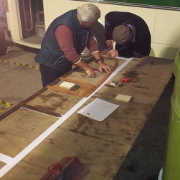 Stuart, Mike H and Steve L are also working on the cab door and associated areas. Recent work has included the fitting of new tyres and batteries, and new treadmaster on the platform, together with the platform pole. The alternator maybe requires attention following investigation of the charging system. Neil has also serviced the brakes. The roof now awaits the fitting of the expertly repaired roof vents, and interior ceiling panels after work on the framework by Cyril and Ian. 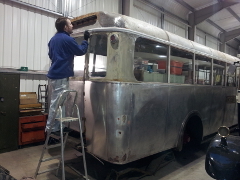 Dave G has now completed all the bodywork repairs and paintwork, and the bus will be presented for test soon. New batteries and two new tyres have been fitted. Our Castle Rally event took place on Sunday 10 June - another successful event, with a record number of LVVS cars attending. Our new meeting room / members' canteen is now virtually finished at the front of the Museum building - more about this project to follow. 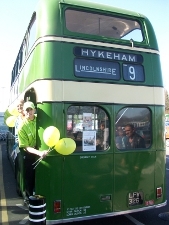 Our Leyland Tiger, FW 5698, took part in the launch event of the Lincolnshire Wolds Walking Festival, Saturday 26 May 2012, and North Hykeham Town Council's Diamond Jubilee event in June. 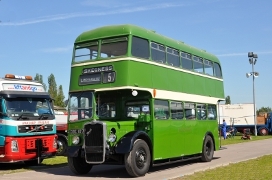 Six vehicles represented the Museum at the AEC Centenary Rally at Newark Showground in May, and the Museum's Utility Daimler was a guest vehicle at the Coventry Transport centenary event in May. 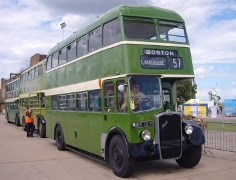 The Society provided the usual park and ride service at the RAF Waddington International Air Show on 30 June / 1 July with buses from the Museum collection and those belonging to members and friends, as well as a display stand in one of the hangars. We will be taking part in the Heritage Open Day event over the weekend of 10 / 11 September 2012 - more information to follow. Decorated Leyland Tiger FW 5698 departs from the Museum on the way to the Diamond Jubilee event in North Hykeham. Northampton Daimler CWD6 VV 8934 takes part in moving crowds at the Coventry Transport centenary event. 1936 Standard Flying 12, TL 5367 having an inspection to assess work needed - we hope it may make an appearance in 'vehicle news' soon. Lincolnshire Bristol K6A, DBE 187 at the AEC centenary event at Newark Showground. Lincolnshire Bristol K6A, DBE 187 leads a line of Museum buses awaiting service at RAF Waddington International Air Show. 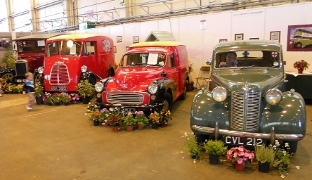 The three Co-op Morris vans and Austin 10 Saloon CVL 212 form part of the Society's display at RAF Waddington International Air Show. Dave H checked over the truck so it could run to the AEC Rally at Newark with several other Museum vehicles at the end of May. It ran really well once warmed up, guzzling a fair bit of petrol in the process! Nice to see it out and about once again after several years' inactivity! Work is progressing well with the Gipsy. 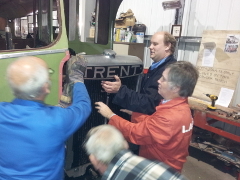 Brian and Lee have now reinstalled the instruments and dashboard controls and have had the engine running. Unfortunately on running up the engine the water pump was found to be leaking, however this has now been reconditioned by EPS services and reinstalled and the Gipsy now runs a treat. 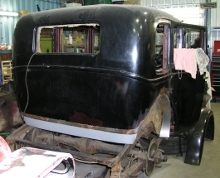 The next job to be tackled was the continuation of preparing the bodywork for paint. New member James has been progressing well with the filling and sanding work on the main body and we are currently in the process of getting estimates to have the prepared body painted professionally - hopefully we should be in a position to go to primer in the next month which will be a great step forward. Another job to be tackled prior to painting is the repair and preparation of the glass fibre hardtop which is now in hand. We attempted to start the Austin 10 prior to open day but found that it was blowing from a couple of the head studs and refused to start. In the weeks following the open day the cylinder head was removed by Michael and Lee, on removal it was found that the head gasket was in a poor state. It was also decided that it would be prudent to have the head skimmed so it was skimmed by Northern Road engineering in Newark who did a good job. We managed to obtain a new head gasket from the Austin 10 drivers club along with a few small associated gaskets. The strip down of the Austin 16 continues, Paul has now removed the sliding roof (after MANY rusted and broken screws were drilled out) and with Michael's help has removed the front wings and grille, We are working towards the removal of the body from the chassis so that we can have a team stripping and rebuilding the chassis whilst the body is welded and rebuilt. With a bit of a rearrange in the workshop and the movement of a couple of completed cars into the Museum we should have the space to take the body off quite soon. 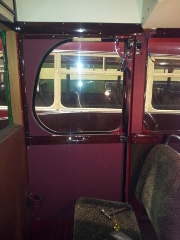 Work continues on the cab, with sliding runners and trim fitted to the nearside window area, and the saloon seat frames to ensure a neat and secure fit. All the seats have been positioned to ensure the spacings are correct before the drilling commences for the fitting! Family team John and Jordan continue to make good progress rubbing down the exterior paintwork with the majority of the nearside now prepared. The cab area floor is pretty grim and will need some expert attention (and money!) though. Eventually it is hoped that this will be available for children to sit in, and 'play' bus drivers etc, and displayed in a post deregulation livery. Thanks to the Manchester Museum of Transport lads, it now carries an authentic destination blind of the period. Although owned by the Society but not officially preserved (it was acquired for spares for the two Museum VR's) an opportunity has been taken to tidy it up for use at the Waddington Air Show by several members. Thanks to Pam, John S, Neil, Ian, Steve L, Andrew and Steve M, Andy, Mike G, Dave H, Dave G, Nick, Norman, Cliff, Steve D and others for their endeavours here. The Reliant tricycle has been worked on by a few members in the past - unfortunately none of them managed to complete what they had started for various reasons, however, work in completing the jobs started has been quite rapid. Neil touched in the areas of unfinished paintwork to make the van look more presentable for open day at Easter then after open day Brian and Lee made a start on sorting out the dashboard / control panel that had been dismantled - this also involved some rewiring and a replacement indicator switch. They now have the van running well and most of the electrics finished. Work currently in progress is the painting of the rear lower light panel and the rewiring of the rear lights; once these jobs are completed we can get the van booked in for an MOT. Following the AEC rally Neil has repaired a radiator leak. Ian has put in many, many hours sat on the roof scraping off all the paint from the aluminium panels to be rewarded with a nice shiny finish, and has now started rubbing down the fibreglass front and rear domes. Meanwhile owner Cyril has continued with building up the exterior cab area, with panelling and mouldings and is repairing the roof vents. 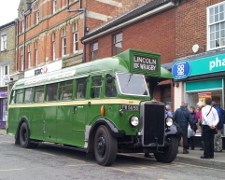 The Museum took part in the 'Discover Lincolnshire' weekend on 10 / 11 March, with buses Lincoln 23 and Lincolnshire 2318 operating a bus service to and from Lincoln City Centre on the Sunday. Our Bristol Lodekka attended the launch of 'Community Life' at the North Hykeham Asda store on 29 March. Our Easter Open Day event took place on Sunday 8 April - a record Easter event. Our new meeting room / members' canteen is taking shape at the front of the Museum building, and was in use for the Easter Open Day. More about this project to follow. 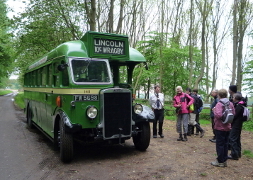 Our Leyland Tiger, FW 5698, will be taking part in the launch event of the Lincolnshire Wolds Walking Festival, Saturday 26 May 2012. Welding continues on the Berkeley - current area of repair is the inner rear area directly behind the rear panel. We have made a new lower rear panel repair & cut a replacement piece of oak to replace the rotten rear oak spar that the rear panel is pinned and screwed to - however before we can fit this panel we need to repair and stabilise the inner panel directly behind the timber, the rear of the body was able to flex and move about as this member was rotten at both ends where it sits on the chassis, plan at the moment is to get the rear end welded back together to give some rigidity and then look to remove the body from the chassis. The Aluminium panel has now been removed from the roof by Paul and we are now looking at the best route forward to try and open the sliding roof without damage - it's been shut for many years and is pretty stuck! 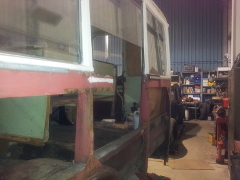 The new tyres are now fitted and the cab renovation continues, together with the saloon interior and roof area. The front brake drums have been carefully cleaned and painted. All the luggage racks are now in (the last fit was very troublesome!) and are complete with bell pushes where necessary. A trial fit of the polished woodwork is also on going to see what is missing (the trim was taken off in 1965). A trial fit of the seats is also being undertaken - these are ex Ben Jordan's yard in Norfolk about 1975 we think! The cab is also receiving attention. An 'Autofare' ticket machine set has been acquired. The '12' returned from its repaint at Lincolnshire Co-operative in time to take part in the Easter Sunday Open Day event. New inlet and exhaust manifold gaskets have been fitted. 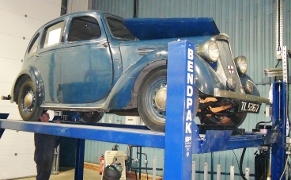 The bonnet top has received attention, with a dent removed and is being repainted. A pre-deregulation destination blind has now been acquired. right - Austin 16, AFY 376, showing new lower rear panel. 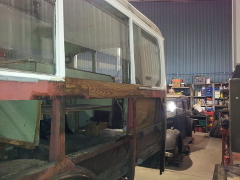 More paint has been stripped from the roof, while the cab area is being re-panelled - it's looking good! The rear end rebuild is virtually finished; some minor mechanical work is proceeding. All the road wheels have been under-coated and top coated and await tyres. The cab renovation continues with the fuel tank (yes the driver sits over it!) being cleaned, repaired and painted. The rear wheel arches have also been cleaned out and painted. A new steel dash panel has been cut out, painted and fitted, with many smaller items being prepared similarly. 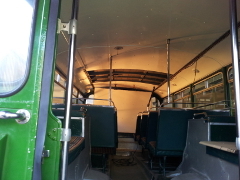 Some of the luggage racks are now finished, covered inside and out, and fitted in the saloon, with more to follow. The first aid box has been constructed and now fits in the first off side bay. This has been a 'delightful' job I'm told - but not in the Sgt Wilson sense! The bulkhead and the first bay have also received new covered panels, as has the area around the rear destination box. More prodding around the cab floor area has revealed the need for much welding to the chassis outriggers etc and new flooring. Work is planned to commence early in the new year. The plan for Lincoln 36 is to smarten it up externally and to use it as a display in the museum, inviting children to sit in the cab, alter the destination blind etc. 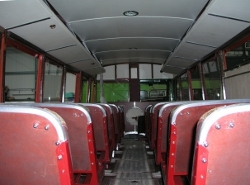 The newly arrived bus at the Museum, former Lincoln 45, has had its wheels and lower rear panel repainted, and two windows replaced. No.45 gave a good account of itself on the day of the Heart of the Pennines rally, standing in for our RE on this occasion. Good progress is being made on the sixteen. This includes welding new steel in the rear wheel arches and rear mudguards. The rear window glass has been removed, with new rubber seals required when the glass is replaced after repainting. On the subject of paintwork a discovery has been made that originally the car was two-tone in colour: i.e. the lower half was maroon whilst the top half was black. Some time in the past a sheet of aluminium was placed over the roof thus covering up the sun roof (sliding head); this was common practice when the roof seal was poor and leaked. The '12' is currently off site having a repaint. Repairs to the front mudguard will also take place at the same time. The wheels will then return to their colour of black. A period Austin sales slogan was: "You can buy a car but invest in an Austin." All the lower deck seat cushions are now reinstated, with new foam and coverings. 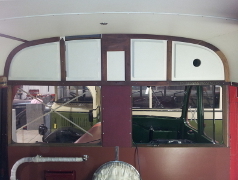 The windscreen is now in, new corner panels fitted and work continues on the cab area and paint stripping the roof. This vehicle left the museum in January, and has gone to a wedding car hire company in Sheffield.